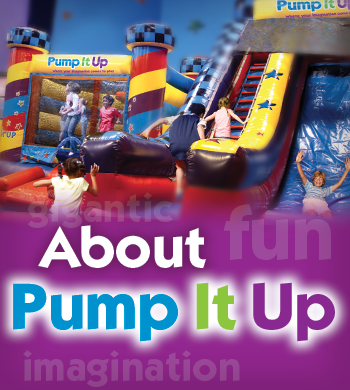 Since 2005, at Pump It Up of Huntington Beach, your party is always a memorable experience. There's fun for all ages in our private, indoor arenas with gigantic inflatables. Our friendly, trained staff is here to help you from the moment you arrive in the parking lot until the guest of honor makes a wish and blows out the candles! A Pump It Up of Huntington Beach party combines imagination and inflatables to create the most exciting party your child has ever had. It’s always stress-free and easy to do. We personalize every party to your specific needs. For now almost 10 years, we have helped celebrate Birthdays for countless Huntington Beach, Westminster, Fountain Valley, Seal Beach and Long Beach families! We are located at the Northwest corner of Gothard Street and Heil Avenue in the "HB Business Center". Just 1 mile from the intersection of the 405 Freeway and Beach Blvd. Pump It Up of Huntington Beach was rewarded Superstar Staff of 2012. Our friendly staff is thoroughly trained to make your party experience the best it can be. "Scheduled a very last minute birthday party for my son who had turned 6. I spoke with the owner on the phone - he was very friendly and it was easy to reserve. Upon arrival the staff greeted me warmly and immediately helped me unload my car. The staff handled everything without asking." "I have to say as a party host if you want a care free environment and have everything handled for you then this is the perfect place to have a party. the staff is very friendly and they do EVERYTHING for you from entertaining the kids to setting up everything in the eating room. this was my first party here and it will definitley not be my last. recommended to all parents!! this place is GREAT!!!" "Great place! Clean and always has a helpful staff. Love the layout cause I can always keep an eye on my kid!"